$461.57Cash price is available if paying by a cash method. With its mirrored chrome finish and die-cast hoops, this 6.5x14 USA Custom Brass Snare from Gretsch is quickly becoming one of my favorite snares that I’ve played in recent memory. Brass is a wonderfully versatile metal that provides a full-bodied tonal response which fits in with a wide array of musical styles. This particular drum, in my opinion, deserves to be played loud. Chrome-over-brass snares tend to exhibit a more pronounced high-end response than do their cousins in black-nickel finishes. This accentuated high-end means that this drum has the power to cut through the loudest of mixes with a bright, crisp attack. This attack is further focused by the inclusion of die-cast hoops, which just beg to be played with powerful rim shots. The 42-strand snare wires add a snappy and sensitive snare response that works across a wide dynamic range. This snare drum offers a bright projection and snappy response that rock, fusion, and pop drummers will want to strongly consider adding to their tonal palette. 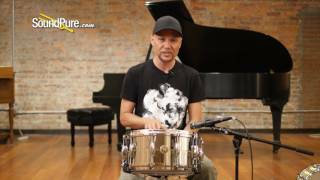 In this video, Sound Pure drums specialist Barry Knain explains the various features of the Gretsch 6.5x14 G4164 Chrome Over Brass Snare, and tests it out in several different tuning ranges.